The ultimate goals of Palms of Paradise are to supply homeowners as well as landscape contractors the highest quality of palm trees and to ensure the specimen of palms are compatible with the location. As a result, consumers are able to enjoy their palm trees for years to come. Palms of Paradise trees are grown in the ground until maturity is reached then hand dug to prevent root damage. 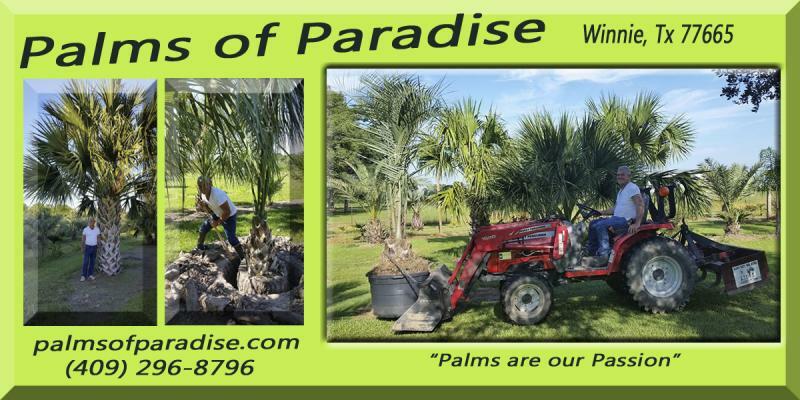 Our palm trees are grown on 20 acres located off of Interstate 10 in Winnie, Texas. Customers are able to walk the palm tree farm and personally pick Palm Trees suitable for them whether it is one that has been recently containerized or one that is still in the ground. If you would like a tree that is located in the ground, there is normally a three to four day waiting period due to demand and hand digging. Palms of Paradise will deliver and plant for a nominal fee. We may be making a delivery or gone fishing. It is always best to call before driving out here. If we are fishing or if we are on a job we will be closed. Tues - Sat. 8 A.M. - 5 P.M.
We will open the gate if you call before you come and we are available if the hours above are not suitable to your schedule. We are located on the corner of 1406 and the Interstate 10 Feeder Road. It is always best to call before driving out here. We may be fishing!